Qal ALLUVIUM; consists of pebbles, gravels, sands and silts. As fluvial and coastal deposits. They distribute near mouth-river of Meta Sakir and Meta Arwala in the eastern part of the sheet. Ql CORALLINE LIMESTONE; consists of coralline limestone and breccia. The age of the unit is Holocene. The unit unconformably ovelies the older volcanic rocks and exposes along the coast of Wetar island. In the Nila cape and Eden cape it forms terrace, which indicate that unit has been uplifted about 500 meter above sea level. Qtv OLD VOLCANIC ROCKS; consists of lavas, breccia agglomerate and pumiceous tuff. Lavas are pale grey-dark grey, porphyritic, jointed and andesitic. The unit distributes around south coast of the western part of the sheet. Thickness of the unit about 350 m (Noya et al. 1986). This unit unconformably covers the Alor formation. Base on the stratigraphic the age of unit is presumed to be Plio-Pleistocene. Tmpa ALOR FORMATION; consists of andesitic and basaltic lavas and breccias, intercalated by sandstone and tuff. The age of the unit is presumed to be Late Miocene – Early Pliocene. The lower part interfingers with the Naumatang formation. Type locally of the formation is on the Alor island (Noya, drr, 1986). Tmn NAUMATANG FORMATION; consists of dacite lavas, breccias and dacite agglomerates intercalated by tuffaceous sandstones, tuff and sandy limestone. The calcareous sandstone contains Globigerinoides sp., Pulleniatina sp., and Textularia sp. indicating the age of the formation is not older than Late Miocene (Budiman, 1978). 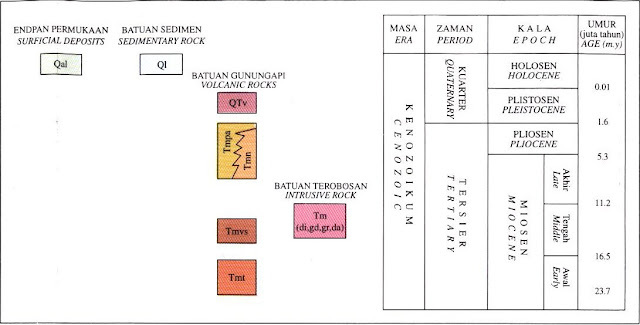 This formation is exposed in the middle part of the sheet, trending from west to east. This unit unconformably overlies the Tihu formation, the rhyolitic volcanic rocks and intrusive rocks and interfingers with lower part of the alor formation, and its good exposure at Meta Naumatang. Tm (di,gd,gr,da) INTRUSIVE ROCKS; consists of diorite (di), granodiorite (gd), granite (gr) and dacite (da). These rocks intrude the Tihu formation and the rhyolitic volcanic rocks. Radiometric dating the diorite shows a 12,6 + 1,3 million years or Middle Miocene age (Abbott & Chamalaun, 1981). Tmvs SAKIR RHYOLITIC VOLCANIC ROCKS; consists of rhyolite lavas. This unit distributes in the western part of the Lalaitu mountains and the head waters of meta vanula. This unit is intruded by the Middle Miocene dacitic dykes and conformably covers the Tihu formation. The age of this unit I presumed to be early Middle Miocene or late Early Miocene. The unit is well cropped out at the head waters of Sakir river. Tmt TIHU FORMATION; consists of andesite and basal breccias, lavas and tuff. This unit distribute in the southern part of the sheet and in the Lalaitu mountain. The unit is named based on good out crop near lake Tihu and it can be correlated with the Kiro formation in the Ende sheet which 19 + 2 million years or Early Miocene age (Nishimura et al., 1981). The area belongs to volcanic banda arc but there is no active volcanic. Geology structures found in the East Wetar are weak faults and folds. Moreover, from airphotographs and ERTS imageries show lineament which its possibly the faults. There are two main fault direction, northwest – southeast and almost east – west or parallel to the island elongation. The faults are sinistral and normal. The strike slip faults trending east – west cut the pre-Late Miocene the Tihu formation and rhyolitic volcanic rocks, while the strike slip faults trending northeast – southeast until Early Pliocene. The normal faults trending northwest – southeast are cut the Late Miocene rocks. Especially, in Tihu lake there are two normal faults which are held the lake. These faults are presumed as a graben system occurring in the post Late Miocene and the forming the Tihu lake was formed. Volcanic activity occur in Early Miocene – Middle Miocene resulting the Tihu formation and rhyolitic volcanic rocks; then it is followed by uplifting together with dioritic intrusions in a Middle Miocene age. In the early Late Miocene, the volcanic activity occurred again yielding the dacitic rocks and form the Naumatang formation, together with andesitic to basaltic rocks of the Alor formation. In the Plio-Pleistocene, uplifting occurs the volcanic activity turned up in the south coast of the sheet forming the old volcanic rocks. At that time Wetar island becomes a land. The last uplifting is in the Late Pleistocene and then coralline limestone was deposited. The uplifting is continuing until now. Andesitic breccia distributing widely in this area can be used for building construction, but in this time is un-useful. Clay is as tuff weathering products, around granite in the Lalaitu mountains, it can be used for ceramic materials. The mineralization in this area is indicated by pyrite in the dacitic rocks. G. Burhan, S. Koesoemadinata, D. Kadarisman, S.A. Mangga and Y. Noya. Geological Map of the East Wetar Sheet, Nusa Tenggara. 1997. 4 Komentar untuk "GEOLOGICAL OF EAST WETAR SHEET, NUSA TENGGARA"